The Servant Brothers and Priests of the Home of the Mother have founded a new community in Urroz-Villa (Navarra). The community is formed by Fr. 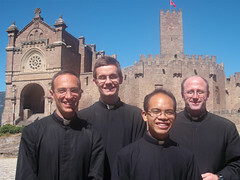 Reinhard (the new parish priest), Brother Andrew, Brother Greggy, John Wright, and Jim Davila. 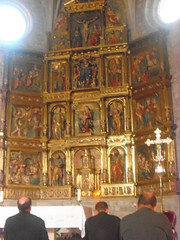 We arrived at Navarra on the 30th of August. The first place where the community stopped was the University of Navarra, and there we enrolled ourselves in theological studies. Afterwards, we went to Javier, which is about half hour from there. In Javier we ate under the shade of trees that are in front of the Basilica and the Castle of Javier. We paid a visit to the Blessed Sacrament and commended the new community of Servants Brother and Priests to St. Francis Xavier. We also commened ourselves to the prayers of the Oblate Sisters of Christ the Priest, who live next to the Basilica. We climbed stairs to the door of the Church of the Annunciation, where the baptismal font of St. Francis Xavier is found. There we prayed the Creed and the Gloria, again commending oursleves to the intercession of the Saint. We ask the Lord that our testimony and our words can bring others to the faith, just as St. Francis Xavier did. We left Javier and drove to Urroz. Fr. Pedro, the parish priest, introduced us to some parishioners. We celebrated Mass at six-thirty, after praying the rosary. After Mass we returned to the rectory to clean it and install our things. Before dinner, Fr. 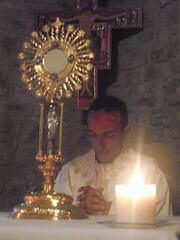 Reinhard exposed the Blessed Sacrament so that the Lord could take possession of the new community of the Servant Brothers and Priests in Urroz.